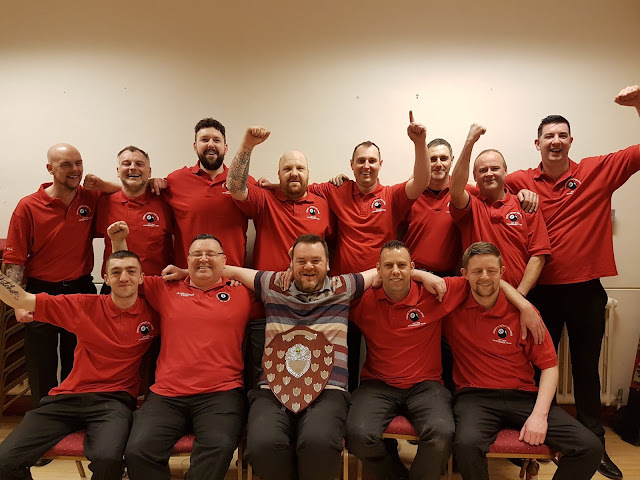 After a fantastic day of high drama Pool with many of NIs top players in attendance Derek Whiteside has led Carrick & District Pool League to success at the 2019 NIPA Interleague 'A' Event. The Competition was held in the Queens Hall, Newtownards and was competed for by 14 Leagues with 11 players per team. 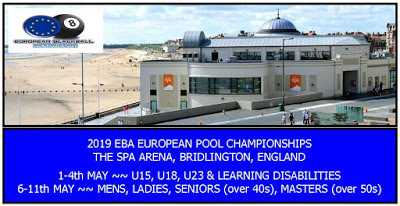 Perseverance and determination which Whiteside has in abundance has finally paid off as he has longed to win this event for years but thought he was destined to the the Jimmy White off the Pool world. Carrick won their group unbeaten to go straight into the Semi Finals and were up against a Ballymena side who had just had a nailbiting 12-10 win over a fancied Coleraine side. In the other Semi Final Play Off defending Champions Larne overcame Crumlin by 12-4 to set up a Semi against Antrim and it was Larne who went on to reach the Final again by defeating a strong Antrim side led by Rab Fee also by 12-4. We all thought it was going to be Ballymena's day as they led 7-4 after the first session against Carrick in their Semi but Whiteside's troops dug deep taking seven out of the next eight racks to win 12-8 and set up a repeat of the 2018 Final that they had lost in a last frame decider. It looked like it was going to be more pain for the eventual winners as Larne started strongly to lead 3-1 but they were to only win one more frame in the match as Carrick, as they had done in their Semi Final, came storming back this time winning eleven out of the next twelve racks for a well deserved 12-4 success with Trevor Whiteside sealing the deal with a precise break and dish in Frame 16. Party time for Carrick !!!! !